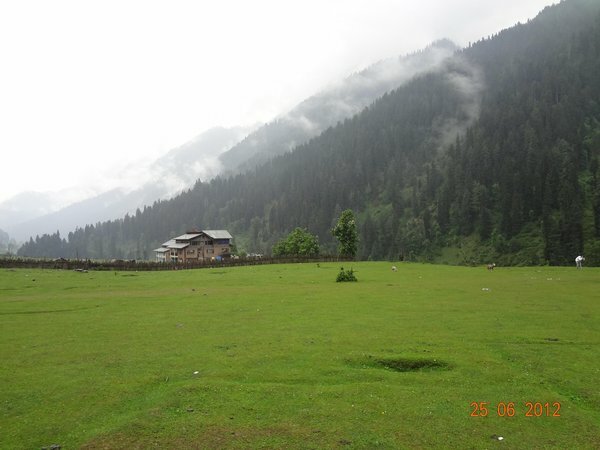 Just returned from my trip of Kashmir, the so called Paradise on Earth. The god has gifted so much beauty to this valley it cant be simply described in words. i)	At Srinagar the Sikarawalas are the top in the list. If anyone books a boat for one hour ( govt. fixes rate is Rs 300/--) they will kill your maximum time in Nehru Garden or at floating market. We hired a boat @ Rs 200/- for 30 mts still the sikarawala was trying very much to take us to the Nehru Garden & at Floating market. 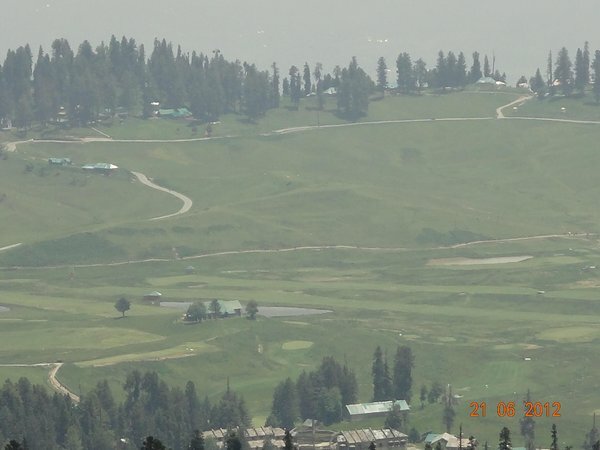 ii)	At Gulmarg they will stop your vehicle 1 km ahead of Gondola ticket counter though this road is well constructed & you will find vehicles moving there. If your team consists of aged or younger person then you are forced to hire a pony & the pony owner would try to force you away from Gondola & book your trip as per his convenience & they dont hesitate to tell a lie. 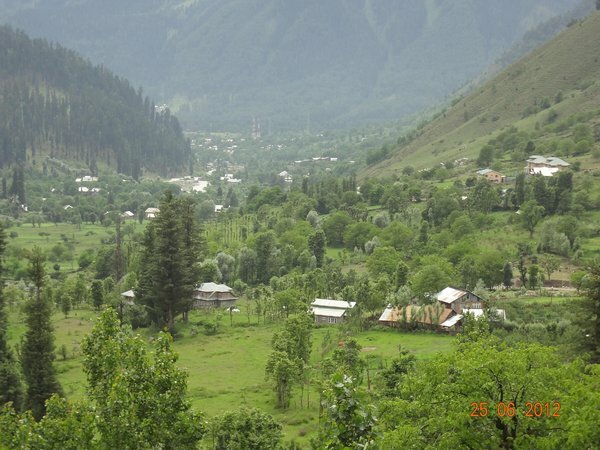 iii)	At Sonmarg & at Pahelgaon you will have to hire a local cab at a higher rate despite having own car. The hired car persons attitude is like he is doing a mercy to us. iv)	This arrogant attitude is a normal phenomenon among hotelwalas, sikarawalas & car owners. They are earning their breads & butter from tourists but behave like a haptawosuliwala. They should learn how to behave with a tourist from a himachali or kumauoni or grehwali. 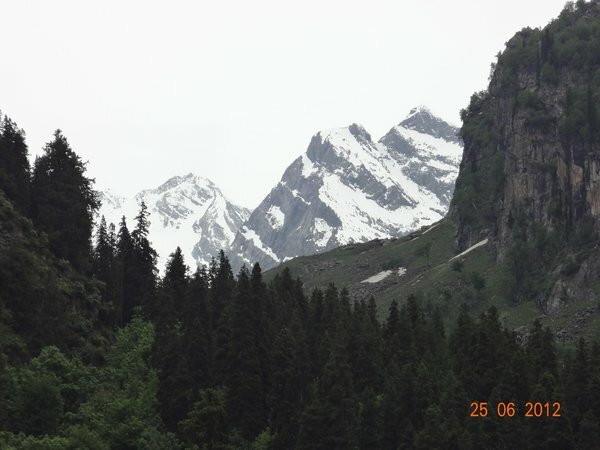 The god has gifted so much beauty but due to this cheating attitude of locals I would prefer my next journey to HP or to Uttarakhand or to Sikkim ( not even to my native state WB) but never to Kashmir. Day-1:- Our journey started at Chakkibank station ( NDLS UHP Samparkkranti exp) at 4.30 hrs in the morning . Our hired tempo traveler with known driver Naresh Kumar (we booked the bus for the whole journey from our known Himachal travel friend Saveen Kumar who is based at Jawalaji, @ Rs 3500/- per day). Then we moved towards Patnitop. At around 12 noon we reached Patnitop. 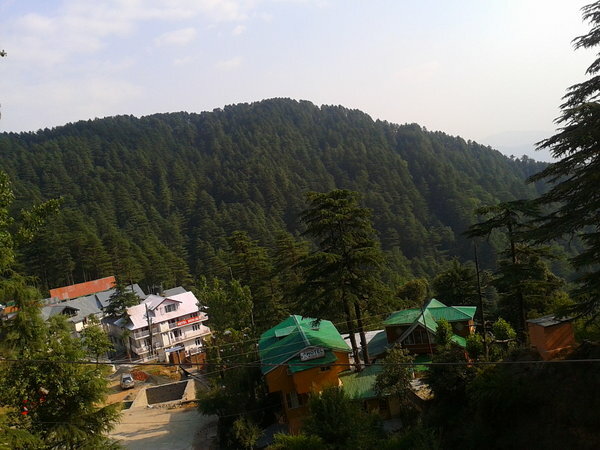 We stayed there at Dogra Residency, a hotel with moderate cleanliness @ Rs 900/- DBR per day. Our stay there was for one night. The place is famous for its PINE forest. 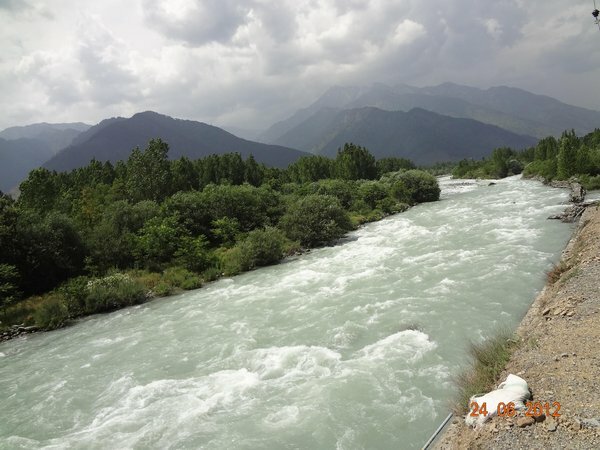 DAY 2:- Today we will move to Srinagar which is about 175 km from Patnitop. We satarted early at around 9.00 hrs. We crossed Jawhar tunnel & got the first view of the valley from Titanic view point. We reached Srinagar at around 4.00 hrs. Our booking was at Hotel Victoria Palace, 3 mts walking just opposite to Nehru park, but from the room Dal Lake is viewed. The room rent was Rs 1000/- DBR. Clean & good room. Dont have own restaurant but just opposite to this hotel there was a good veg restaurant. Day3:- Today we proceeded towards Gulmarg ( about 50 km from srinagar) We left before 8.00 hrs as we were informed that there is big rush at Gulmarg GONDOLA. 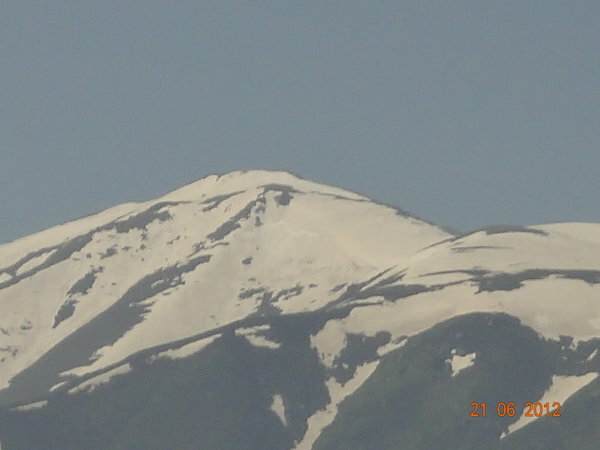 We reached gulmarg at around 11.00 hrs . There was a big line infront of counter but ladies counter was less crowded. We got ticket & lined up for the ride. This line was also very long ( like we see during DURGA PUJA at Kolkata or KALI PUJA at Barasat). We got our chance to ride the Gondola after about 45 mts wait. The journey was of 4- 5 mts upto phase-I. After we reached Afarwat the authority stopped issuing ticket for phase II due to heavy rush. In the picture you will find the rush. 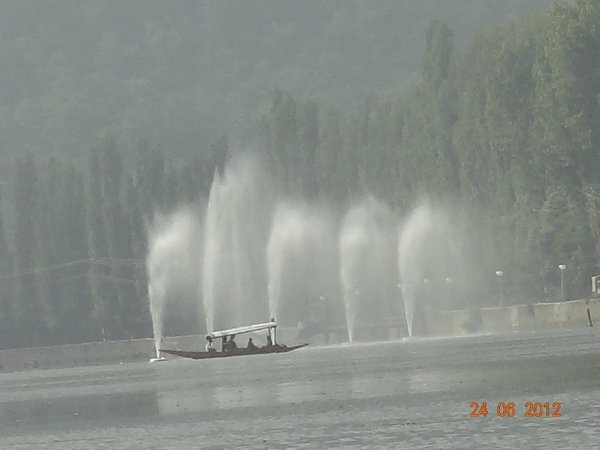 We returned Srinagar in the afternoon and roamed around Dal Lake. 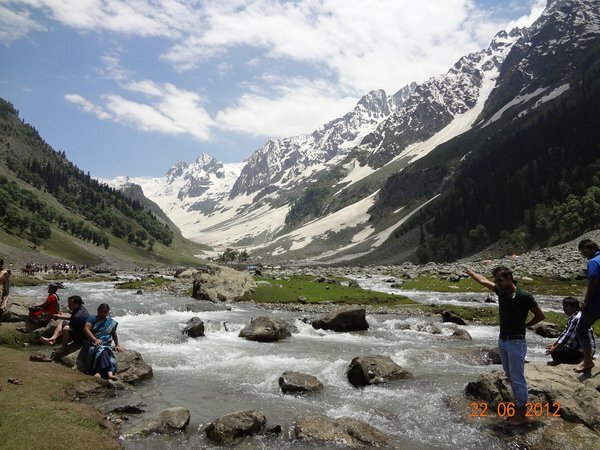 Day-4:- Today we went to Sonmarg ( 90 km from Sonmarg). The path to Somarg is very nice ( actually path to all places of the valley is beautiful). At the glacier point, where we walked (other option is pony). Actually at the entrance you will have to leave your own vehicle & hire local car for a 4km journey @ Rs 800/- (to & fro) for financial benefit of locals. This type of Dacoity with tourists is also common at Pahelgaon. After getting down from the car we had to walk another 1 km to reach the glacier. What we saw there ? Just have a look (remember this is the end of ice left, so anybody visiting this place in April-May can imagine the kind of snow they will get. But those who are going During Durga Puja, mainly Bengalies should remember they will not get a trace of ice that time until & unless fresh snowfall happens by that time). 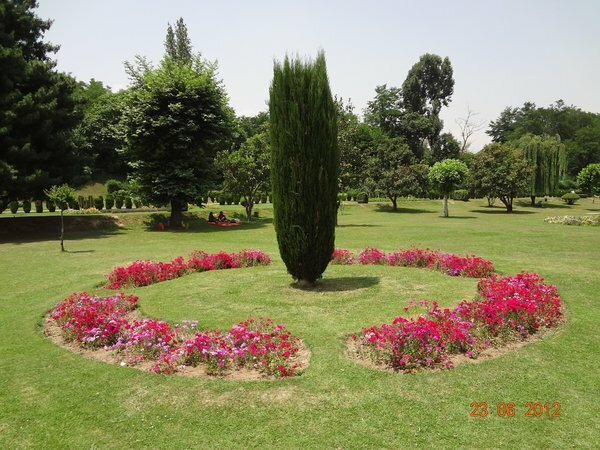 Day 5:- We visited local gardens mainly Nishat Bagh & Chasamshashi . Second half of the Day was spent for Marketing & Shikara ride. 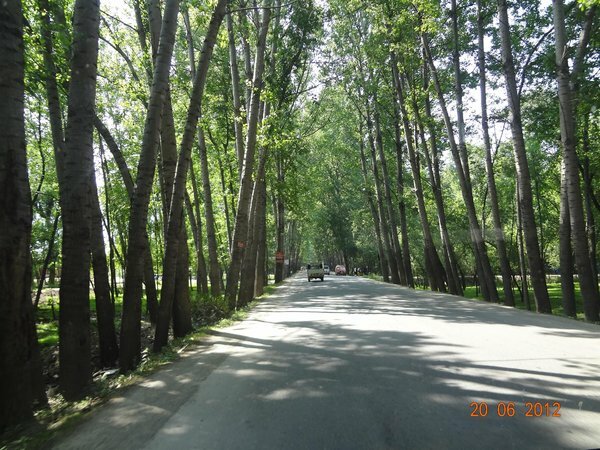 Day 6:- Today we will move from Srinagar to Pahelgaon as we will stay next two days there. We left early because we new there will strict security on the road as next day will be opening of Sri Amarnath Ji jatra. We had our lunch at Khanabol. We reached checking point of Pahelgaon by 2.00 p.m. but there we had to unload all luggage from roof of the bus & to get it passed through X Ray chamber, then we proceeded towards Pahelgaon with river Lider. At pahelgaon we faced tremendous jam which we generally see at Kolkata. It took more than an hour for us to reach our Hotel (Mehtab situated after Police checkpost) from entrance point of Pahelgaon. We entered our hotel at around 5.00 p.m. & ordered tea & pakora . Soon it started raining & first time in our tour we realized the need of Jacket & woolens. Hotel rooms were moderately clean & room rent was Rs 900/- DBR. 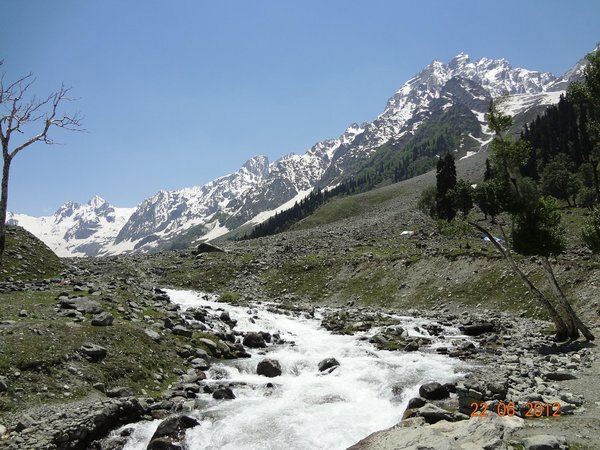 Day-7:- We visited Aru valley, Betab valley & Chandanwari by lical car (travera @Rs 1800/- for the half day tour) anybody can imagine the kind of forceful cheating going on there with the tourists. Day 8:- Today is the end of our Kashmir tour. We left Pahelgaon for Udhampur to catch UHP NDLS Samparkkranti exp. We reached Udhampur railway station at 4.30 hrs . It is a very clean & nice station though dont have any canteen. We boarded our train for Delhi & from there to kolkata with sweet memories of Kashmir. SOME ONE PLEASE SUGGEST ME HOW TO UPLOAD PICTURES, ALL ARE OF MORE THAN 6.00 MB SIZE & ARE IN MY PENDRIVE. I had inserted those pictures in the write up but the pictures have not been uploaded. I was waiting for your Trip Report. This will surely help me in planning my forthcoming trip to Kashmir. More than anything else, your report would surely forewarn future travelers. It is scary, really! How one can enjoy "heaven", when such elements are roaming around freely?? Can you please offer some tips how to avoid confrontation with the tantrums of ponnywallahs at Gulmarg as well as at Pahelgam? Me & my wife are senior citizens and as per your report, we would be the likely targets of these people. 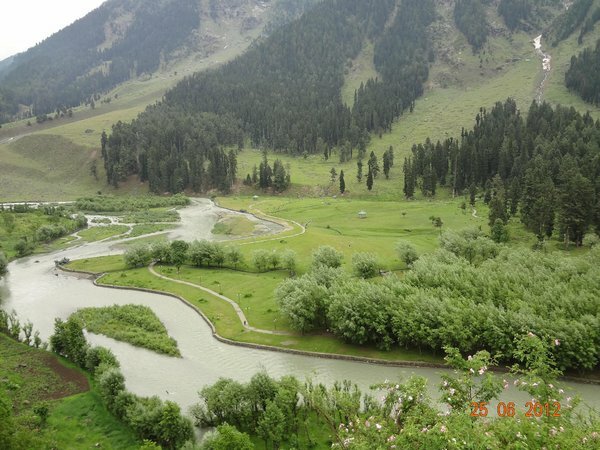 About accommodation used by your Group at Patni Top, Srinagar as well as Pahelgam, did you pre book these places and if so, from where? If you haven't prebooked, how did you manage to book these places just on reaching there? I ask this question as because your journey coincides with Yatra Amarnath Ji and there must be mad rush of visitors during this period. I'm a budget person and I am visiting during Sept. Can give some tips to book hotels (budget type) etc.? 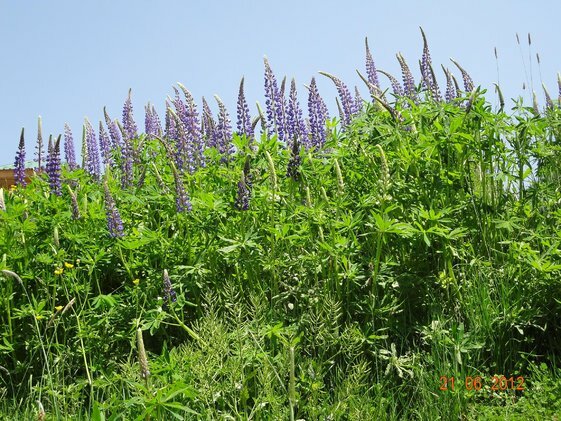 As regards inserting pics, I am absolutely a novice, yet I somehow could post pics in IM Forum. I would now explain the process (it may not be the ideal process, but it worked) adopted by me. On the top of your post you will find a "Gems Clip" symbol. Click on this symbol, a window will appear where "Choose file" option will be displayed. Click on this and select your pics and then finally click on "upload" option. 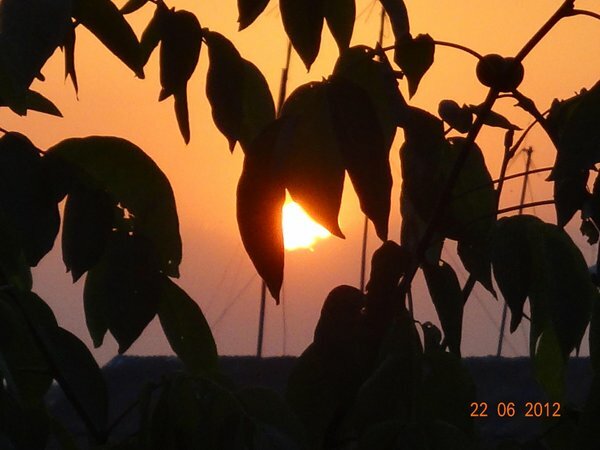 Wait for sometime till the picture gets displayed on your post. I'm not sure whether this would be of help to you or not. Waiting for your response. Thanks. Originally Posted by KOUSIK MUKHERJEE SOME ONE PLEASE SUGGEST ME HOW TO UPLOAD PICTURES, ALL ARE OF MORE THAN 6.00 MB SIZE & ARE IN MY PENDRIVE. There is Attachments button in the shape of U-Clip just above the message box (where you enter the message). 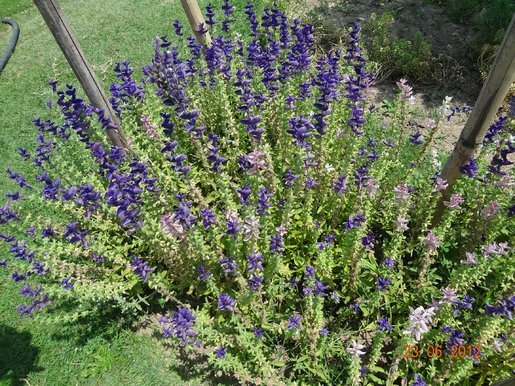 You need to click it and attach the photographs. For more detailed information, please study the details at thread how to insert photos in a thread! If you are going in Sept. I think by that time Sri Amarnath ji jatra will be over. So crowd will be much less. We booked our hotel through the person from whom we hired our bus. Actually we were a team of 4 senior citizen, 4 adult & 2 kids (mine was of 14 months old). So, I had to pre-book my hotels as a result in some place( as I have mentioned in my write up) the rooms were not up to the mark. But the hotel at Srinagar ( Victoria Palace). At Gulmarg if you don't want to hire a pony (as we did) smartly & politely reject the offer & walk 1 km to Gondola Ticket counter (it is a pitch road, so walk slowly as you are aged). 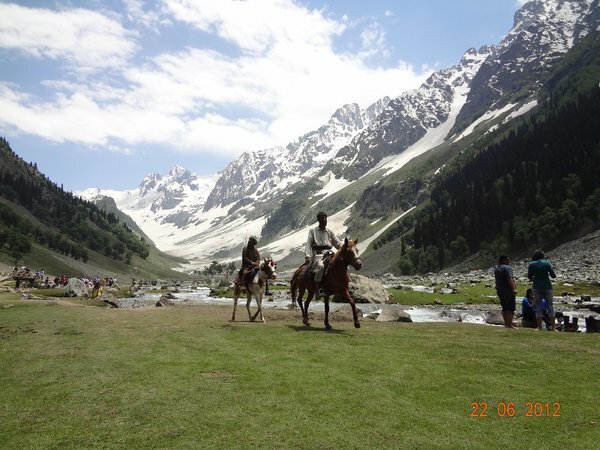 At Sonmarg last 1 km you have to hire a pony or walk (it is uphill), but during September you will not get snow. The ponywalas will try to tell you that they will take you to iceworld. Just be negative in that case showing your age as a problem. 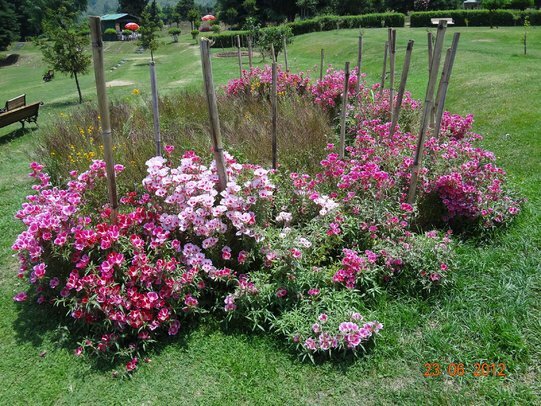 At Pahelgaon there is no other problem than to hire a local car for the local site seeing. It is a govt approved system. In that case your rent for your hired car for that day is a waste. Anything else if required feel free to ask, will try to answer as per my knowledge. Have posted some pics. of small size, yet unable to resize the others, so couldn't post. How is Victoria Palace Hotel at Srinagar? Can you please elaborate your experience of staying there and of the quality of hotel, rooms, ambiance etc.? I checked their own website : http://victoriapalace.in/ and as per their published tariff plan, they have two sets of plan, one set is valid from 1st March 2012 to 31st Aug 2012 and other set is valid from 1st Sept 2012 to 28th Feb 2013. The tariff for the first set is higher than that of the 2nd set. Your team stayed at Srinagar during June 2012 and hence your tariff should be as per their first set. As per this set, DBR would cost 1400/-, whereas you had actually paid 1000/- and that too during Amarnath Ji yatra period! May I conclude therefore that there are substantial scope of bringing down their published price? In my case my planned stay would fall during their 2nd set of period (off season?) and in this set their published tariff for family room is 1500/-. Now if I take a cue from your input and if I can bring down the rate for family room to, say, 1000/- my job is done! What do you suggest? Congratulations for being able to post your pics, which are really very beautiful. Next time, try to add some caption for each of photographs. I will try to collect details of that hotel & if I can I will post it. As we had booked rooms 3 months ago & that too as a bulk I think for that reason my travel partner (actually he is Himachal based) got it at Rs 1000/- . Later on I came to know that he has booked it thru Debbhumi Travels, KOlkata. If you keep courser o the pics you will find the description of the place. Still would try to add some caption next time. I find your report a bit scary . Can you please clarify whether it is otherwise safe to visit Kashmir . There is some sort of fleecing in all tourist place , which is somewhat moderated by presence of Government mechanism to handle tourist . Could you please clarify whether you are forced to take pony or hotel or cab and refusal resulted in "dadagiri " . Locals at all place try to mob tourist once he arrives to sell their service . But does refusal to take the offer or bargain created any safety issue ? 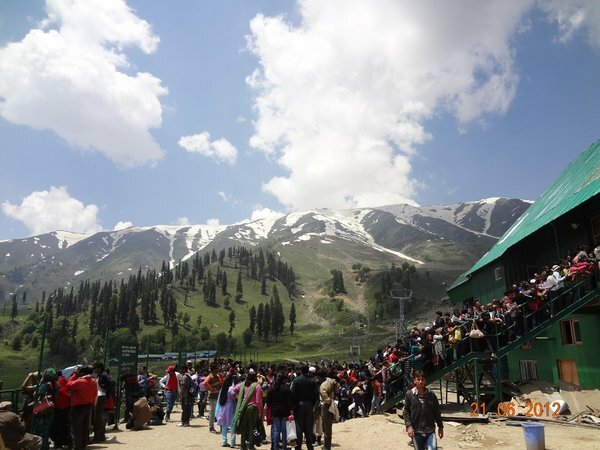 At some place like Pahalgaon or Gulmarg there is system of hiring local cabs for sightseeing . Although that's bit hard on pocket , but it is probably to support local economy which may be necessary to generate employment . nearby , as you might have seen during you visit . Another querry is about drinking water - did you have to purchase at higher rates at Srinagar onward ? I dont think refusal creates any safety issue, you just need strong to be strong enough not to fall for their pressure tactics. 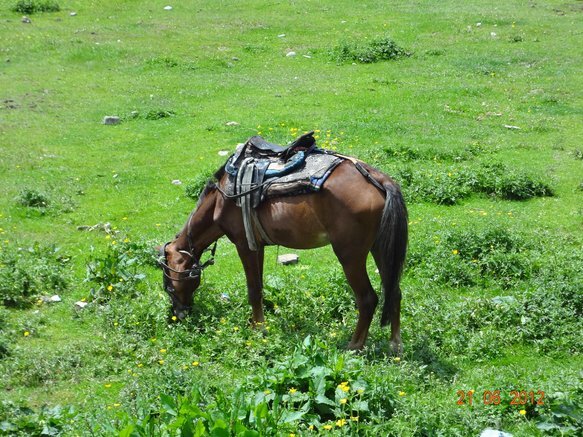 We did quite a few hikes around pahalgam without using a pony,though we had a guide. 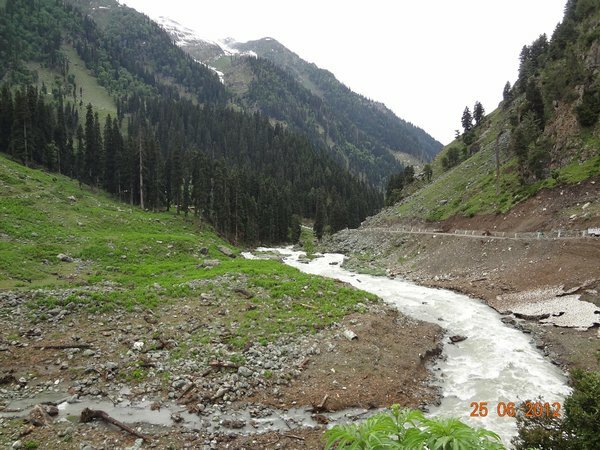 You could do that in sonamarg too. The service providers would not force their service on you, though they would pester to use the service. My take: Refuse politely if not interested in engaging them.